A truck hauling chickens tipped its load onto a Delaware highway Wednesday morning, spilling crates of live birds onto the roadway and shoulder. 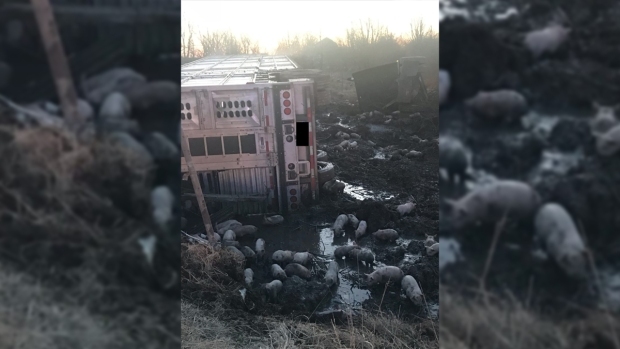 The Delaware Department of Transportation says the tractor-trailer hauling the chickens lost control on a curve and overturned. The wreck happened before daybreak and blocked part of southbound Route 301 near Middletown for several hours, ruffling some commuters' feathers with minor delays, New Castle County dispatchers said. Live chickens were seen flapping around as crews worked to clean up the scene. No word on how many chickens were killed in the crash. The truck driver wasn’t seriously hurt. The Delaware Department of Transportation told WDEL that both saddle tanks on the truck were damaged, resulting in leaking fuel. The Delaware Department of Natural Resources and Environmental Control accordingly responded to the scene. Route 301 is a gateway to the Delmarva Peninsula where chicken processing is a major industry. About 605 million chickens were raised and 4.2 billion pounds of chicken were produced on the peninsula in 2017, according to the Delmarva Poultry Industry, Inc.